PEPPERMINT is the ice-cream flavour Riley North’s daughter picks at the fair. The film could also be called Rocky Road the flavour Riley (Jennifer Garner) choses for hers or also for the awful route the revenger thriller takes. When Riley North’s (Jennifer Garner) husband and daughter are killed in a drive-by shooting by members of a cartel and the killers walk free owing to corrupt officials on the cartel’s payroll, she takes matters into her own hands and seeks vigilante justice against those who destroyed her life. The film begins with a slice of Riley’s family life. Husband is overly loving, daughter annoyingly cute and smart and everyone is lovey-dubey. After Riley’s family is killed, she takes down the killers one by one till she reaches Garcia, the chief villain. Added to the story is the vigilante element (DEATH WISH). 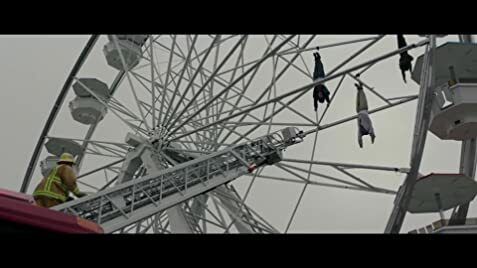 The film’s lazy script does not bother with plot details or character development or even suspense build-up, all the laments necessary to make a good thriller. Showing Riley with her family enjoying fun times together is a very laze way to get the audience to feel for her. Nothing is shown how Riley got to transition from loving mother and housewife to martial-arts expert and super fighter. One short clip is shown of an MMA fight with the cops saying that Riley was in one of the fights. The fight scenes are barely exciting – too much gunplay and fast cuts to examine in detail what actually happened. Garcia’s henchmen are all buffed but too easily beaten by Riley in unbelievable punch-ups. The only one interesting character is that of cop Carmichael (John Gallagher). He aids Riley initially – in fact too much. When it is revealed that he is actually Garcia’s undercover, his initial actions do not add up. He could have done her away many times given so many opportunities. Jennifer Gardner now joins the ranks as an actress in action films. Having carved her name in fame for romantic dramas, she looks entirely out of place kicking and fighting int he movie. She only looks convincing at the start of the film as the loving wife and mother. THE TOMB RAIDER or HUNGER GAME actresses would have fitted in better. Putting in a female fntaed of a male in the revenge action genre at least makes a welcome change, given the film’s limitations and problems. 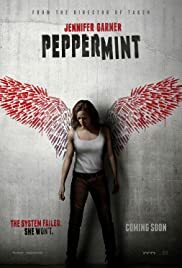 Cardboard characters, simplistic plot, silly plot twists, unexciting action sequences, uninspired acting, mediocre sets and music, PEPPERMINT leaves far to be desired. Successful films of this genre that include Morel’s previous Liam Neeson revenger TAKEN are often described as guilty pleasures. PEPPERMINT is a total displeasure. The film at the press screening ended with a blank screen instead of closing credits. “No wonder the film is so bad,” remarked a fellow critic. “It wasn’t even finished.” But whether finished, edited or improved, it is doubtful that the film will impress.